There are two types of CDN Static services - CDN Static (Pull) and CDN Static Push. Please refer to Overview of CDN services for more details. Go to Services → New Service → Static. 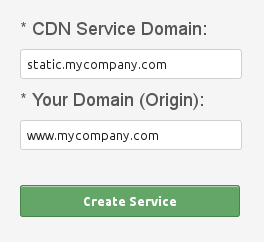 Fill in your desired CDN Service Domain. Fill in any valid domain name, please refer here for more details. Fill in domain name of your website (Origin Domain) as in the picture below. Click on the Create Service button and you will redirected to a CDN integration how-to page containing all necessary information (including optional DNS instructions) required for successful integration of your CDN service into your website. You must have at least one storage. 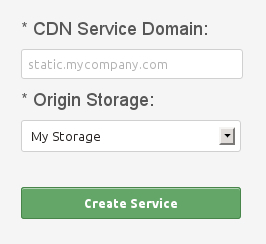 If you don't have any storage then please refer to Creating a CDN storage for more details. Go to Services → New Service → Static Push. Select Origin Storage as in the picture below.